Sue Brown and Lorraine Irwing .This is a rare chance to see this Oxford based a capella duo locally. 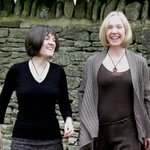 Their exciting take on English and Scottish traditional song has captivated audiences in folk clubs and festivals over many years, Their performance has been described as ‘perfection in timing and expressive melody. We love the sound they make and of course you will get the opportunity to join in. Their new Cd “The 13th Bedroom” is out now.